Welcome to the Fort Scott Community College Miami County Campus (MCC). The MCC is a full-service outreach center located in Paola, Kan. Over the past decade, the MCC has grown and expanded along with the needs of the communities it serves. Read more about the history of the campus. The faculty and staff at the MCC strive to meet student needs by fostering a mutually supportive relationship between the college and its communities. The MCC offers a wide variety of courses during the day, evenings, weekends, and even online to fit students’ busy schedules. In addition to offering all courses required for a two-year associate degree, the MCC offers technical training in healthcare, nursing, environmental water technology, construction trades, criminal justice, and welding. The college also works to serve area high schools including Osawatomie, Paola, and Louisburg. High school students can get a jump-start on their college careers by taking concurrent courses through this partnership. 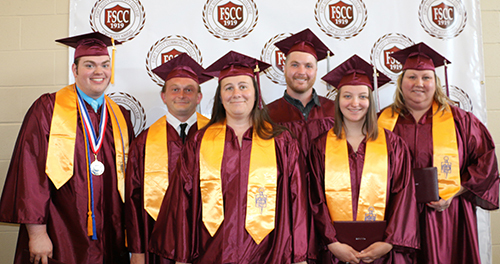 High school juniors and seniors who are enrolled in college level courses can earn FSCC college credit for these courses—they just need to apply, enroll, and pay for the college credit. Through the Excel in CTE Initiative, some courses may be tuition-free. Students should check with their school counselors or with the MCC for an updated list of courses/programs that apply. For more information about the Miami County Campus, please contact us at 913-294-4178 or visit in-person at 501 South Hospital Drive in Paola, Kansas. Students can complete the coursework and obtain a two-year associate degree for any of the following degrees without leaving Miami County.